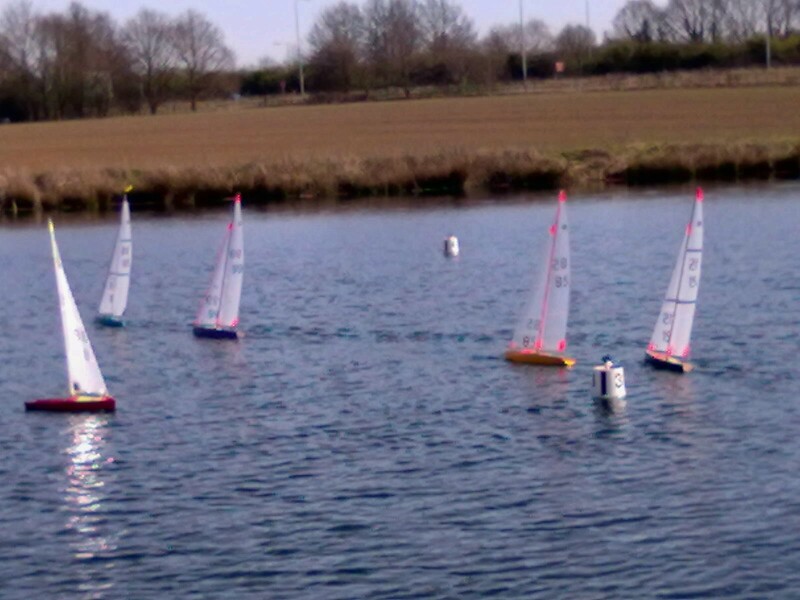 The 19th February started with a moderate, westerly breeze blowing at the Blackwater Sailing Club practice lake. By 9-45am the briefing took place under clear blue skies and pleasant winter sunshine. The course was set and explained to the assembled 14 skippers who had travelled from as far as Norfolk and Eastbourne to join the local Essex sailors, by race officer Graham Childs. An Olympic triangle and sausage course was sailed for the first race and with one buoys slight relocation this course remained for the rest of the day. The sky changed from blue to grey and back again throughout the day but it remained dry. 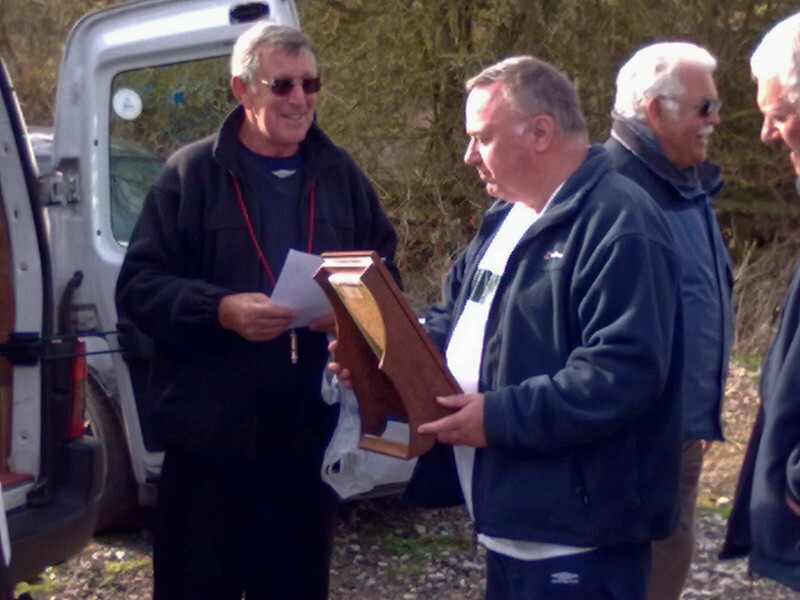 The tricky course and conditions resulted in 5 different skippers attaining a first place finish, despite this the Trophy winner, Colin Goodman did so with 23 points from the 21 races completed. 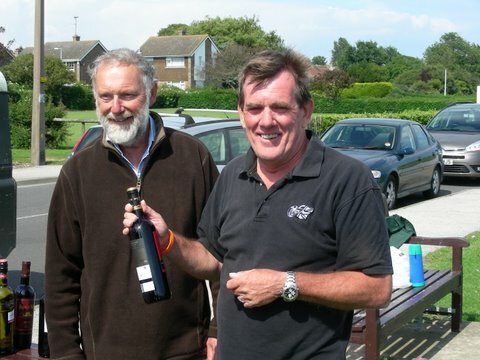 Trevor Binks ( a visitor from Eastbourne ) achieved the second place with Vernon Appleton of the Coalhouse Fort MBC came third. The next three fishers were all from the local club, Chelmsford Radio Yacht Club. David Hope 4th, Malcolm Harris 5th and 6th place Phil Newman. All racing incidents were remedied by penalty turns which reflected well the good mannered and good tempered atmosphere that existed throughout the day. 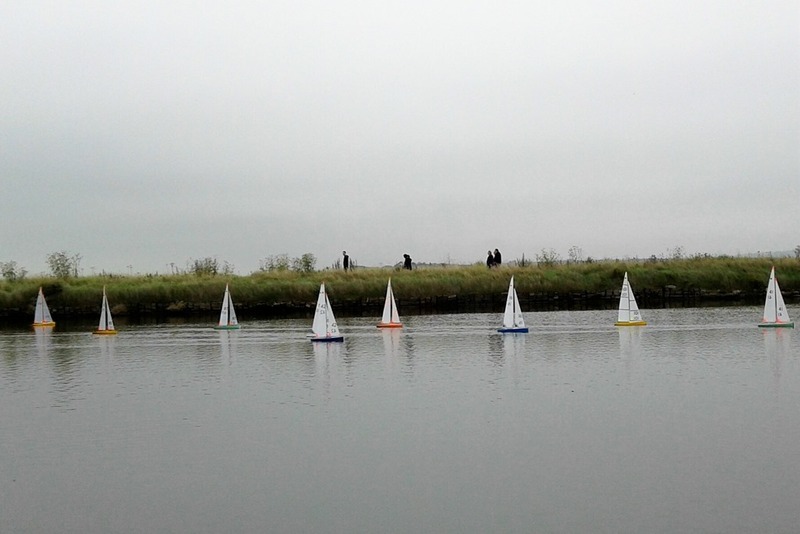 On a warm but overcast Sunday 22nd September 2013, Coalhouse Fort hosted the Thames Trophy and Round 5 of the Eastern District Championship Series (EDCS) for IOM Boats. With the wind from primarily the West, Graham Childs the Officer of the Day set an initial course which included a saw tooth (Fig 1). Later in the day the wind moved round slightly causing a change of course (Fig 2). The first five races saw five different winners which suggested no one skipper was going to dominate the day. However, this was soon to change once Phil Playle got his eye in and with sevens wins out of the fifteen races he was the clear winner. Other race winners included Graham Bartholomew (3); Vernon Appleton (2); Alf Reynolds (2) and Rick Buxton (1). There was some very close racing, although when Phil managed to get the lead early on he was able to create quite a gap between him and the rest of the fleet. The only casualty on the day was Henry Farley who withdrew after race 6 with a winch problem. Whilst there were a few protests they were all resolved on the water and our thanks to all the skippers for their behaviour. The overall winner was Phil Playle followed by Graham Bartholomew in second and Vernon Appleton third. 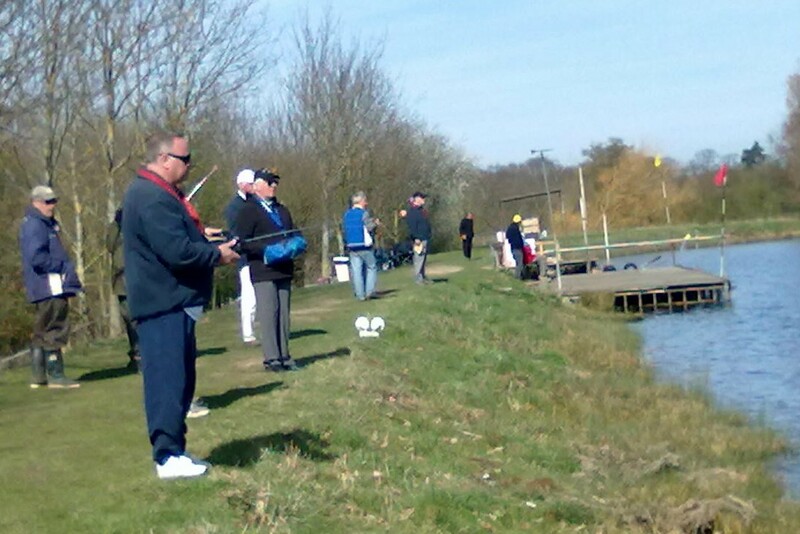 This now leaves the final round of the EDCS to be hosted by the Broads club at their Filby Bridge venue on Sunday 20th October 2013. I arrived at Clayton Hill at 9 a.m. as planned to find most competitors there before me which was no surprise. What was surprising was that they were not in the car park but on the access road! Some kind soul had vandalised the lock on the gate so we couldn’t get in. 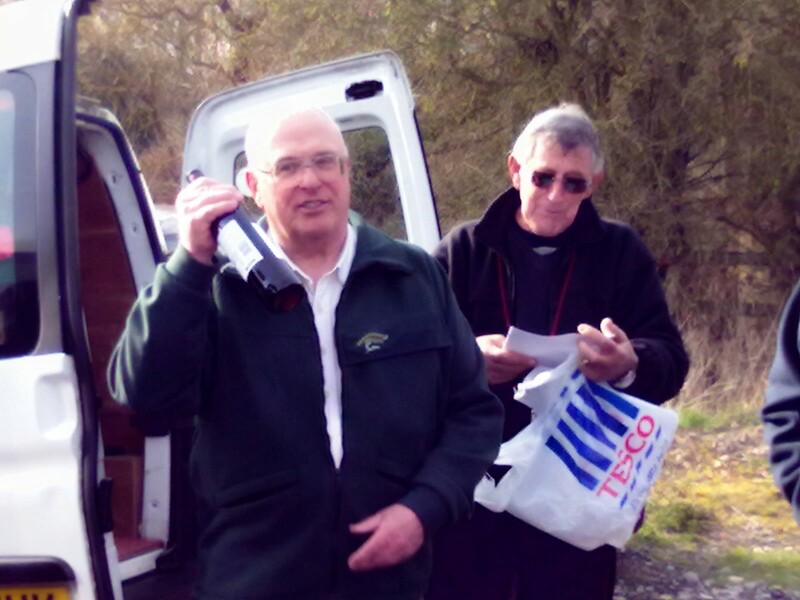 John Richmond on behalf of the Chelmsford club offered the use of their lake which was gladly taken up. With a bit of delay on my part to ensure that everyone involved would know of the change, we had all arrived by about 10:15. The wind was fickle and light so setting a course was challenging all day. While watching one race and thinking about the next it was all to easy to consider a course change only to find that by the time of the next race it was back to where we were. I took the decision to do minimal changes and accept less than ideal courses just to make sure we spent time sailing rather than chasing wind direction. As study of the results table will show, the wins were spread among the top half of the fleet and they all had their bad results. Perhaps not to surprising given the nature of the wind conditions where it was at times critical to be in the right place – if only you could determine where that was for this race! Once or twice what looked to be a clear winner got a fright as the pack approach much faster but I think all managed to scrape home to win. More remarkable was an occasion when Terry got overtaken by Vinnie just before the line but even then got a puff to give him the place. In the end John T was just that bit more consistent that Graham to take the win by a couple of points. One or two characters are worthy of mention though not all for their results! The East Coast contingent made a rally towards the end with Vinnie taking two wins on the trot and Rick winning the last two races. Too late though for either to move far up the order though I expect those wins made their day! Pete Sutton has a special switch to conserve battery power, though having your main sheet turn of the power does diminish your ability to control the boat. Maybe that’s what made his boat reluctant at couple of times to cross the finish line – or does he need new glasses? Rick found a floating line on one of the buoys before the start of one race but got off it so we all though it was sheer incompetence until another boat suffered the same fate but couldn’t get off. Others managed to attach their boats to buoys at times but that was truly incompetence. When doing the finals scores on the laptop I had a bit of a fright as it reckoned that it couldn’t save the file. I’ve not met that before so in the end just shut it down having written down the results. When I got home everything worked OK and the file had been saved – weird! At lunch time John Blanks took the RNLI bucket round and thanks to the usual generous nature of all concerned we raised £110 for the Institution. That was picked up this evening by an RNLI official who happens also to be the Lee Valley treasurer! I’m very grateful for the help give by my club colleagues John Davies and Richard Hesketh to run the event, to the Chelmsford club for the use of their water and to the skippers who took everything in good spirit to make it another very pleasant day’s sailing. Brentwood Model Boat Club hosted their annual Icicle Trophy on Sunday 2nd December 2012 on a cold frosty but sunny morning. Thirty skippers from as far away as Eastbourne and Norwich approached the lake with some trepidation, concerned that there might be ice on the lake, but their fears thankfully did not come to fruition. 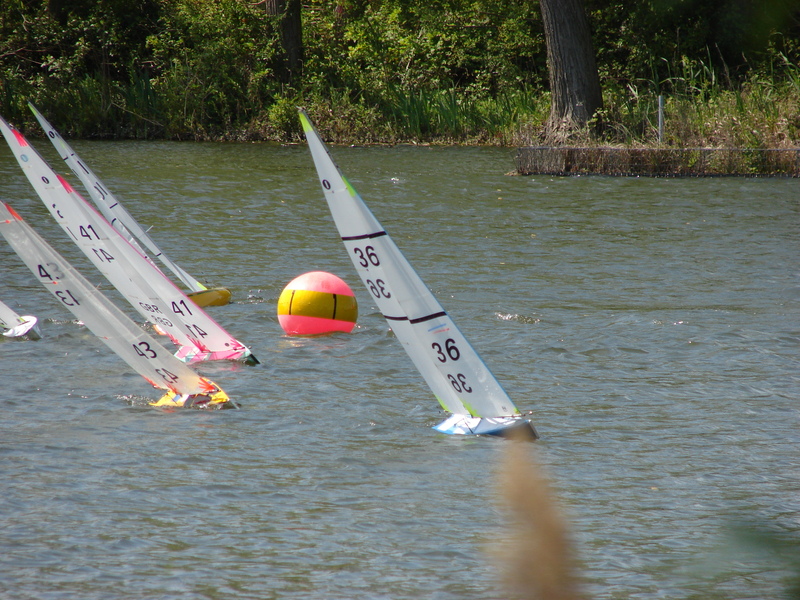 However, whilst the sun was shining there was very little wind as the first two seeding races got underway. Malcolm Schaffer, the Race Officer, set the best course he could under the circumstances, as what wind there was came almost directly from the back of the skippers. As such the course was initially an Olympic triangle with a sausage. After a couple of races when the wind had managed to increase slightly this was changed to two triangles, which did leave to some confusion during one of the ‘A’ Fleet races such that it had to be re- run. But, around lunchtime the wind dropped again and the course was returned to the original but with a wider wing mark. Apart from the confusion regarding the course change, all other incidents were corrected on the water and in view of the conditions, all skippers are to be congratulated on their behaviour. We had a few skippers who were participating in their first open event and they coped with the large number of boats on the water extremely well. Whilst one or two skippers missed the last race, there were no boat failures and everybody seemed to enjoy themselves even though at times it seemed like they were watching paint dry!! At the end of the day after five races had been completed with one discard, Trevor Binks was the winner on six points, with Mark Dennis from Chelmsford second on 11 points and Ken Binks from Eastbourne a close third on 12 points. A copy of the full results can be found on the Results page. 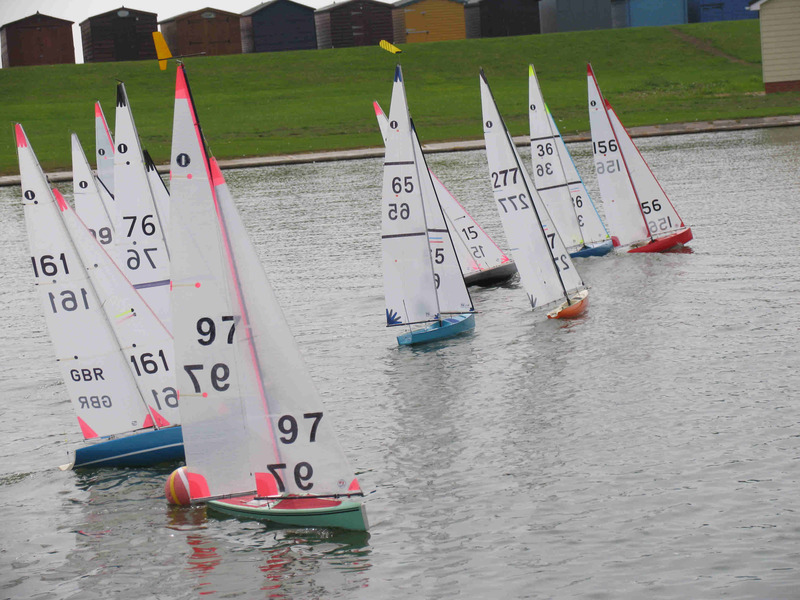 Harwich & Dovercourt MYC hosted the Murrison Cup on Sunday 21st October 2012 at their Dovercourt seafront venue. Nine skippers braved the very wet conditions as the OOD, David Kerridge, set a traditional Triangle and Sausage Course with all boats on top suits. The visitors soon mastered the conditions, with Mark Dennis winning three of the first four races, and the host club had to wait until race 7 to post a win, when Jon Alexander was successful. Mark remained dominant with Jon and Graham Bartholomew fighting out the other podium places. Terry Burton was also successful, winning on two occasions but seemed to lack consistency. Racing was keenly fought throughout the fleet, with Vicki Mills breaking into the top three on 7 occasions, giving her the upper hand over local rivals Geoff Earle and Robin Bloyce. Unfortunately the wet gremlins forced Nigel Gilson to retire early, whilst Malcolm Schaffer experienced gear failure after 9 races. Eighteen races were completed, all sailed in an excellent spirit. Please click on Results for full details. 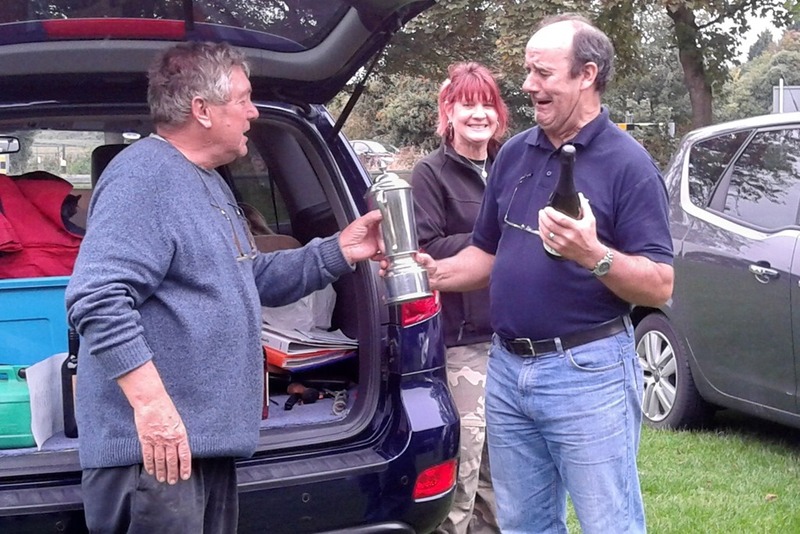 The Thames Trophy and final round of the Eastern District IOM Championship Series was hosted by Coalhouse Fort on Sunday 23rd September 2013. The forecast was for strong winds and plenty of rain but when we arrived it was one of those days when the correct suit to use was not that obvious. So whilst most chose top suit a few selected No.2. It stayed that way all day with some changing up then down while others did the opposite. The wind varied in strength as the above probably indicates but the rain was a different story! Initially it there was none but it then started to drizzle which gradually got stronger. However the big change came a little before 2 o’clock when it really started to rain heavily. Shortly after that by common consent the event was terminated. The wind direction was no help to Graham Childs who set the course. He chose two circuits of a ziz-zag course with a down wind finish. He assured me that he was not influenced by the Olympics, where this seemed the standard, so must have had some undisclosed reason! The starboard rounding of the far mark caused the usual collisions for such conditions which the gusty wind did nothing to help. However all incidents were settled by the offenders doing the required turns so racing continued without the need for a hangman. Terry Burton won the first race so it looked as if he was going for an overall win. That would have given him a strong position to challenge George Beacroft for the EDCS Trophy. However it was not to be as the top spots were fought for by George and Graham Bartholomew, who between them won the remaining 9 races. They finished on equal points but by having one more win than George, Graham took the honours for the day. The rest of us, in varying degrees, were some way behind. Congratulations to Graham Bantock on winning the Corden Cup and Round 4 of the Eastern District Championship Series for IOM Boats. The event was hosted by the Harwich & Dovercourt Club on Sunday 12th August 2012. With fourteen competitors and nine races, Graham managed to take four wins making him a clear winner on 10 points. Next up was Graham Bartholomew on 21 points closely followed by Terry Burton in third place with 22 points. At the Model Yacht Pond Dovercourt – Eastern Region. As I sit in the back garden writing this report on the day after the event-the rain clouds are brewing. Very different from the weather we had for the event. We were lucky to pin it to the final day for the Olympics as the prayers of those who had made representation to the Olympian gods for good weather had been spectacularly well answered! Certainly it was also a great deal better than the conditions causing the flooding and the subsequent cancellation of the initial event. The day was mostly sunny and warm with a light to moderate East / South East breeze which picked up strength for a while in the afternoon. 14 competitors came up to the line. 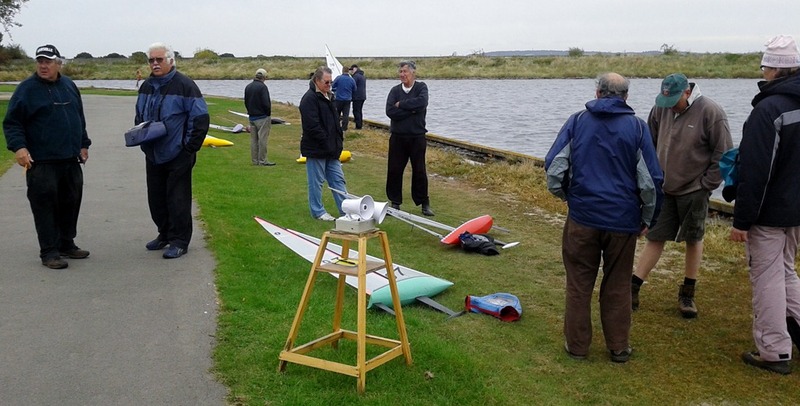 Many of the Eastern region clubs were represented and the decision was taken to divide the fleet into two heats. Harwich pool is oval but bot not particularly wide. The wind direction meant it was not straight up and down the pond but offset by some 30 degrees. This provided the officer of the day with a slight head ache in setting a course and the competitors were eventually confronted with a course giving them a long beat up the to the windward Mark – but meant the finishing line was on the opposite bank and thus some distance from the competitor area. This was to lead to several protests at the end of hotly contested races as boats both collided with each other and made contact with the finishing buoy! One or two competitors were at odds with each other and race officials about whether such rule breaches were down to them – but again the ‘Happy and Glorious’ Olympic spirit seemed to have percolated down as far as Harwich and by the end of a truly glorious day – everyone appeared to have enjoyed the show and clapped heartily at the wine distribution at the end. Particular Thanks must go to our secretary – who had a difficult job as the race computer started spewing out some odd results despite the valiant attempts of the IT mogul. As a former maths teacher the secretary was obviously the man for the job – so while the rest of us muzzled into sandwiches and enjoyed the sunshine in the break – he spent the time with pencil and paper constructing hand written results and doing all the sums! Thanks everyone – competitors – officials and club Commodore Jon Alexander– for a delightful day’s sailing – one of the few this summer so far! R, W. Howard – Treasurer H&DMBC. As we arrived at theBrentwoodLakefor the Coventry Trophy and the second round of the Eastern District Championship Series for IOM boats, on Sunday 25th March 2012, a mist hung around with a slight easterly wind. As the morning progressed the mist lifted but the sky was still overcast and it was bitterly cold as the easterly wind started to increase. The wind was fairly consistent in direction but variable in strength for the whole day so no course changes required. Around midday the sun started to break through giving us a relatively warm and sunny afternoon. Malcolm Schafferset an Olympic Triangle plus sausage course starting in the near corner at the fishing lake end; then out to the middle of the lake on the far side for the first mark on port; back to the near side at the car park end of the lake for the second mark again on port; along the bank to the start mark, out to the first mark, then back to the start mark and back to the first mark to finish all on port. With only thirteen skippers participating it was still decided to run two fleets withTerry Burton and John Torrance taking the wins in the two first seeding races. It was obvious that Graham Bantock was struggling with radio problems as was confirmed by the fact that he did not complete the next two races. Apart from that nobody else seem to suffer any problems regarding failures and all protests were resolved on the water, and our thanks to all the skippers for this. 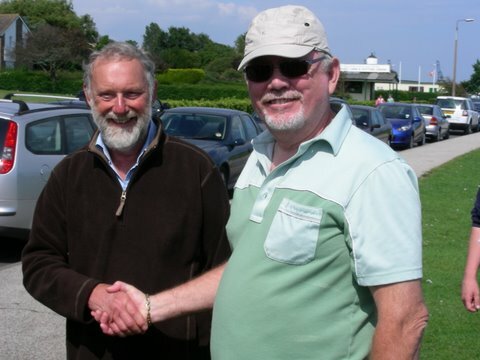 Once Graham Bantock had resolved his initial problems, he went on to have a reasonably good day with four firsts to give him second place, but was unable to catch George Beacroft, the eventual winner, who had developed a winning lead in the morning. George did suffer a minor set back in the middle of the day with two visits into the ‘B’ fleet but quickly recovered his composure in the afternoon. As a consequence of George’s issues,Peter Suttonwas the event leader but he also had some issues in the afternoon which dropped him down to third overall. A good days racing, albeit with limited participants but thanks to all those skippers who entered and who were well behaved on the day. Please click on Oliver Lee Trophy for a detailed report of the Oliver Lee Trophy hosted by Chelmsford RYC on Sunday 8th January 2012.
trying day – and so it proved. At the start the wind was from the WSW which gave a sensible beat to the first mark by sailing diagonally across the lake from left to right. The traditional triangle and sausage course fitted the bill nicely. As the wind backed to a more southerly direction is was possible to move the windward mark for several races. However that reached a limit when the wind blew almost straight into our faces. Now we had an awkward start line and as the course was restricted to the wider end of the lake we did an extra triangle. 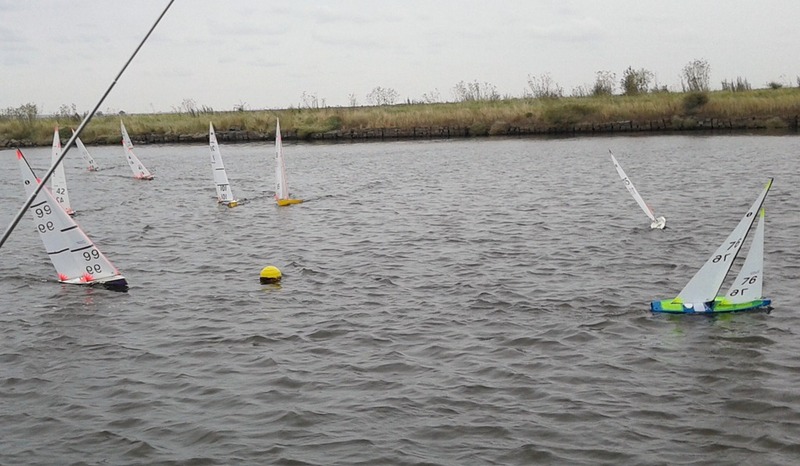 Sailing in two heats we managed 8 races at a relaxed pace interspersed with the need to move buoys around. There was a lot of close racing though occasionally the leader got well away. No protests came ashore and there was little argument amongst the skippers. There was however a marked reluctance to accept a penalty unless the infringement was called by an observer. Many incidents were missed and to not do your turn unless called is not in the spirit of sailing. The result was a close run thing between the top three with Vernon Appleton and Jon Alexander making their presence felt too. The final order was determined by the last race. Prior to that Terry Burton was 2 points ahead of George Beacroft and Graham Bartholomew. Jon andVernon then followed in that order. Terry, Graham and Jon did relatively poorly in that last race while Vernon and George took the top spots. There were several ‘new’ boats in use. 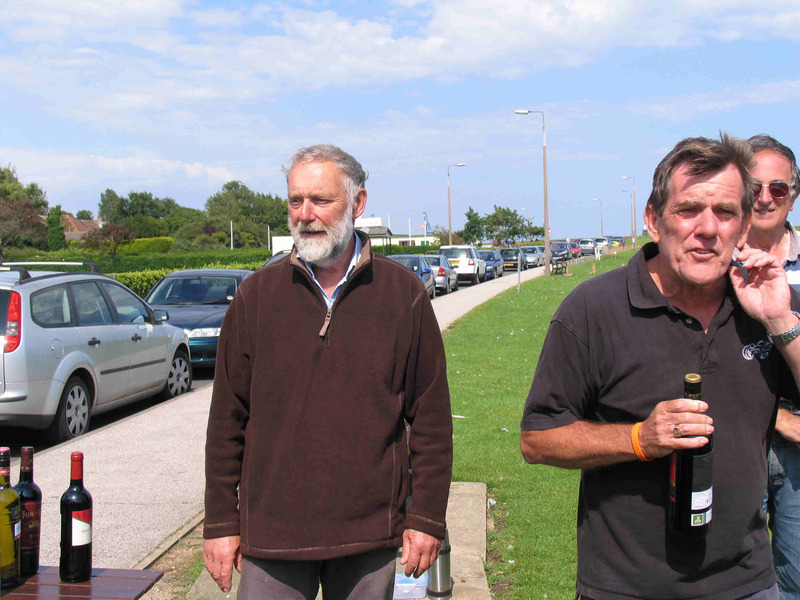 George and Graham were both sailing the mark 2 Arrival while Jon had a locally built Italiko. John Richmond was sailing the ex-Malcolm Harris Isis whilst his awaits a replacement fin. We were pleased to welcome 3 skippers from out of the District in the shape of Michael Chamberlain from Rotherham, Chaz Jordan from Hampton Court and Vinnie Zammit from Malta. Vinnie now claims allegiance to theBroads club and so gets EDCS points! Putting the Corden Cup results into the EDCS table gives us the result below. Malcolm Harris still retains his top spot. John Torrance also retains his second spot. The rest of the top ten have played musical chairs! 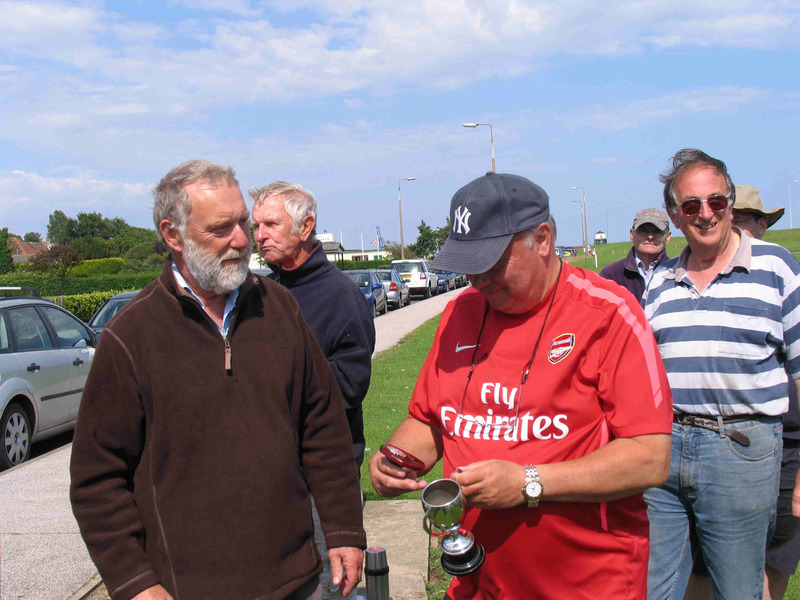 The next event of the EDCS for 2011 will be the Norfolk Trophy at theBroadsclub on September 18th. That is despite being labelled as round 6 in several places. The explanation for that is that to make a bit of space in a crowded calendar we have combined the Thames Cup, EDCS 5, with the second day of the Eastern District National Ranking events on September 25th. Only members of ED clubs will be eligible to win the Thames Cup or get EDCS points. 14 skippers booked in, including 3 possibles none of whom made it, for the 2011 Lifeboat Pennant IOM event atLeeValley’s lake at Clayton Hill . Wind was forecast to be somewhere between 16 and 19 mph depending on which forecaster was used. It didn’t ever quite make than level most of the time but was a good top suit strength with some very deep lulls and few scary gusts. The common triangle and sausage course was used with the start line a little upwind from the leeward mark and the finish a bit downwind of the windward mark. 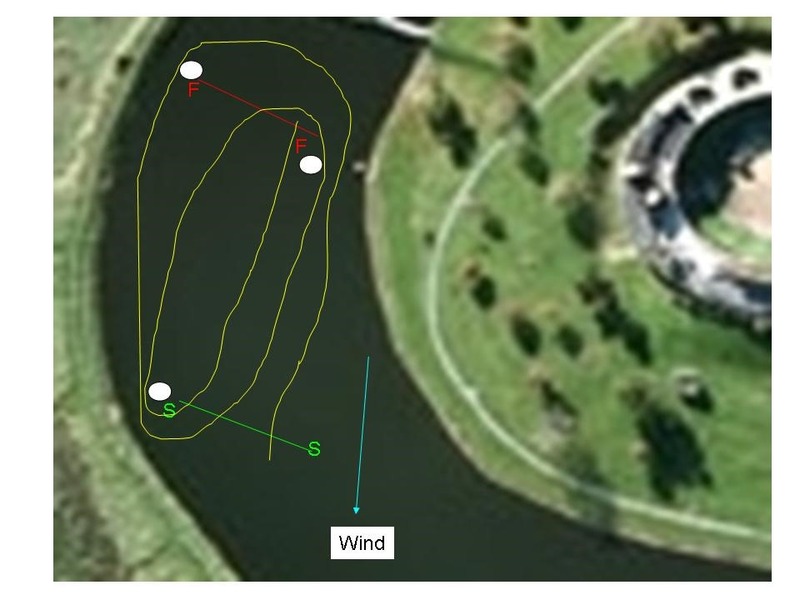 Initially the course axis was straight up and down the length of the lake but as the wind came rather more off the near bank the windward mark was moved towards it. Even with a fairly leisurely pace we managed to complete 17 races to give 3 discards which proved very valuable to some including our winner. Often there was not a lot of wind at the windward mark and folks got themselves, or really their boats, into difficult situations by trying to sail too close to other boats and the mark. With the mark fairly near the bank, boats often approached it on port tack and then found themselves being challenged by those that tacked on to port earlier to approach on starboard. There were relatively few incidents and all were settled amicably on the water. So the race team of Henry Farley, Derek Davies andRodney Lathamall from the home club, had a busy but not difficult job. There were however a few collisions that could have been avoided by a little forethought. Mark Dennis, winner of the event, had a fairly poor start and another couple of disasters but with six wins and five seconds (and the three discards!) was well ahead at the end. Vernon Appleton sailed pretty consistently most of the time and wins in races 9, 11 and 17, but a couple of disasters in races 3 and 16, came a clear second overall though some way behind Mark. Rick Buxton looked set fair to take the honours with wins in the first two races and a second and another win in races 4 and 5. His later results were up and down but he did mange another win late in the day to take third place. George Beacroft has yet to get the measure of his new Arrival 2 and today’s conditions were not ideal for tuning for best performance. Nevertheless with a couple of wins his final score was not far behind Rick. Malcolm Schaffer managed one win though it looked at times as if he might take another one or two. Like a lot more he managed to find holes in the wind to allow others to overtake him. 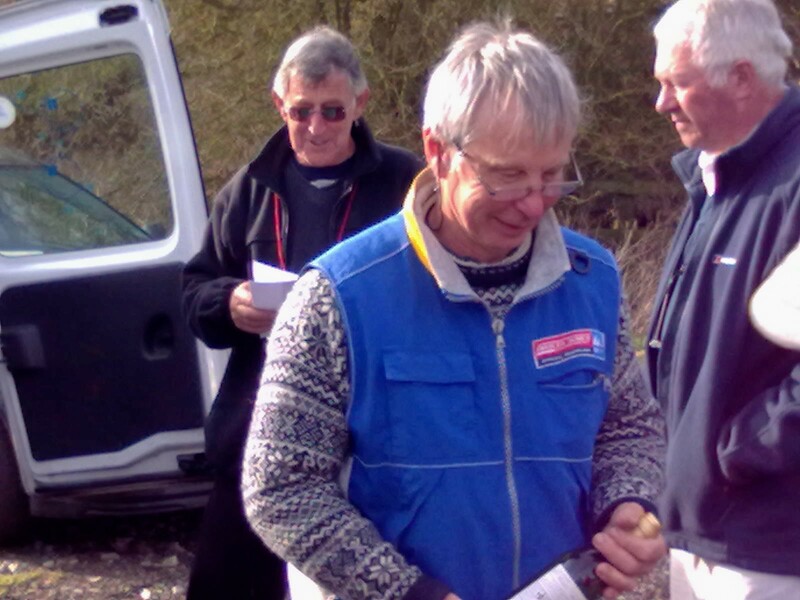 Last year’s District Champion Graham Bartholomew had a poor start using an unfamiliar Tonic which he had borrowed for the day but began to get the measure of the boat and won Race 3. His results were variable for the rest of the day so his final position was well below what we have come to expect. John Newton was a strong contender quite often but somehow didn’t manage to turn that into many good results. Perhaps a few too may incidents didn’t help. The final three in the fleet were not used to sailing at this level and struggled in the conditions which made the lives even harder. Luckily for the race Committee they all at least enjoyed their day. As is usual for this event, run today for the 21st time, there was no entry fee but skippers were invited to contribute to a collection for the RNLI. Once again the total came to £100 thanks to their generosity. Not that there was much between to top few. Every one of them had a race or two in the B heat where those of us that didn’t manage a win had to be content to do well enough to win promotion from time to time. There were a few incidents with most being settled on the water though one or two involved a bit of ‘debating’! One protest did come ashore and resulted in a DSQ. As far as I could tell only one skipper had gear trouble. Robert Fawbert lost control near the far bank several times before giving up and acting a permanent observer. Possible causes are that his 2.4 GHz receiver had its two aerials horizontal in the pot, and their ends touching, while his transmitter aerial was vertical. Having transmit and receive aerials in the same orientation is always a good idea. Oh the above doesn’t include the incident where I removed young Dan Heartstone Jnr. jib just before the start! So in conclusion it was another enjoyable day’s sailing for which I’m sure we all thank Malcolm Schaffer and John Newton. On Sunday 27th February 2011 the Icicle Trophy postponed from December 2010 eventually took place, hosted by Brentwood MY & PBC. On arriving at the lake there was a frost but the sun was shining and everything looked perfect including a reasonable wind until we saw the direction – Northwest. Basically about the worst direction you could have for the Brentwood venue as it was blowing across the lake from behind the skippers’ backs. This set John Newton on his first official open event as Officer of the Day, the task of setting a course which would provide the skippers with a challenge. The course was eventually a couple of ‘saw-tooth’s’ starting in the far corner near the car-park, up to the near corner, then out to the far middle, back to the launch area, then out to the far corner (fishing lake end) up to the near corner, then diagonally out to the start buoy and finishing in the near corner using the first buoy. This turned out to be quite a challenging course as evidence by the fact that in any one race the lead changed up to five times. 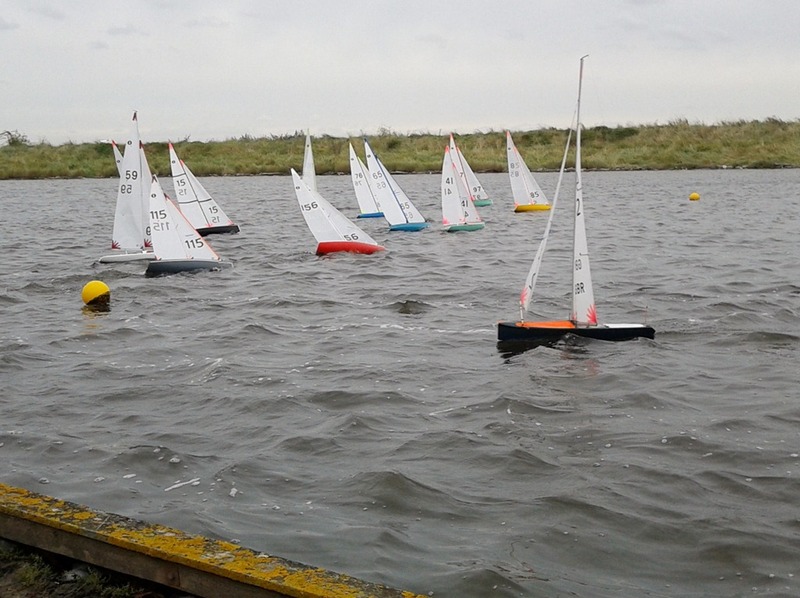 Whilst the wind remained fairly consistent until the last few races, it was swirling at times which meant you had to be in the right place at the right time – typical Brentwood conditions. two fleets. These conditions suited Mark Dennis, who seemed to be able to cope much better than most and as a consequence took 5 wins out of the 9 races and was the obvious winner. Whilst there were a number of incidents during the day, these were all resolved on the water and thanks must go to all the skippers for their cooperation. There was only one retirement during the day, namely George Beacroft who appeared to have a winch problem. With Mark Dennis winning the event, Trevor Binks from Eastbourne was second and Malcolm Harris third. We look forward to seeing everybody at the event again in December 2011 weather permitting. Please click on Belton Memorial Trophy1 for a report on the first round of the Eastern District Championship Series (IOM) and Belton Memorial Trophy. Please click on 2011 Oliver Lee for details of the Oliver Lee Trophy hosted by Chelmsford RYC.